A little explanation about our title for today. 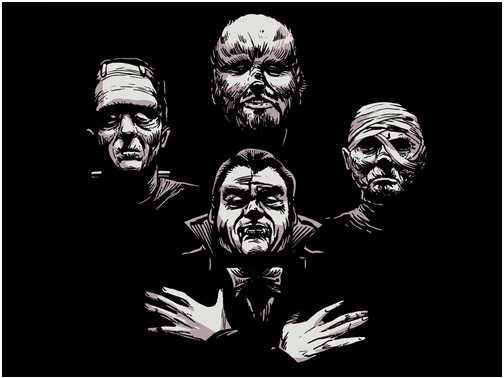 When Universal started releasing their monster movies they were all the rage, but over time 1 monster just wasn’t enough. Someone came up with the brilliant idea of combining the monsters. So they would name it the House of stuff (but instead of stuff it was like Dracula or Frankenstein). I thought that Lollipop Jones & Pecan Sandie should contribute to that proud tradition. Yup, the boys are back in town. As he let loose a malevolent laugh, the other assembled monsters joined in. The wolfman, Peter Stubbe, split the night with a howl that lasted through the final notes of laughter. “And what about those two detectives?” Dr. Henrietta Von Frankenstein asked. Rachael N. Field, reporter assigned to follow Chief of Police Alyssandra Mendez, stood outside the offices of Lollipop Jones & Pecan Sandie. She waited until the daring detectives arrived. It was still several minutes before their scheduled office hours, when she heard the approaching footsteps of something heavy. Turning towards the stairway door, she saw the oversized frame of Pecan Sandie squeeze through the doorway and step into the hall. “Mr. Sandie, a pleasure to see you again.” Field called and gave a short wave. Pecan nodded. “And what do we owe the pleasure of this visit?” Lollipop asked from behind the reporter. Rachael followed Pecan into the office, with Lollipop entering last. Sitting down in front of Pecan’s desk, Rachael surveyed the office. “I only had a few questions regarding the recent events at the museum.” Field explained, as she flipped open her notebook. After asking a few superficial questions, Rachael thanked the detectives and left their office. As she passed through the small waiting room, she dropped something behind one of the plants in the corner. “So we haven’t had any luck with the exhibit at the museum.” Lollipop stated. Pecan nodded. The duo had been through every article associated with the exhibit that Dracula had hitchhiked in with, and they had found no clue as to where the lord of the vampires could be hiding. Outside, the sun was starting to sink behind the buildings. A loud knocking came from the door. Stepping into the small waiting area, Lollipop opened it. Standing in the hallway was Alyssandra Mendez, the chief of police. “Hey Chief.” Lollipop greeted. “Ms. Jones, I’m afraid I have a warrant to search these premises.” Mendez stated, holding up the paper. “What?” Pecan rumbled from the office area. Some of the policemen reached towards their sidearms. “I wouldn’t do that guys.” Lollipop cautioned. “What did they see?” Lollipop asked. “He’s been in the office with me all day.” Lollipop Jones stated. “Chief?” One of the police called from the small waiting room. “Excuse me.” She said, stepping out to speak with her men. The chief returned a moment later, carrying a woman’s wallet. “Can you explain how this got here?” She asked. “Never seen it before.” Pecan stated. Pecan flipped his desk into their path and rushed across the small room. He lifted up Lollipop Jones and burst through the window behind her, landing on the fire escape. “What?” She started to ask. “Run.” Pecan rumbled, as he began to slide down the stairs to the next floor. After repeating the procedure several times, the duo were in the alley. Lollipop saw flashing blue lights on one end of the alley, but not the other. Running away from the police, she heard Pecan Sandie trundling along behind her. Several blocks away from their office, seeking shelter from the cold autumn wind, the duo sat in a parking garage stairwell. “You know who’s responsible for this.” Pecan stated, his voice filled with anger. “Yeah, it’s odd. It’s almost like lazy writing, but anyway. Looks like it’s time to meet the press.” Lollipop Jones stated, heading out of the stairwell. Rachael Field was walking out of her apartment to her car. Her eyes were glazed over and she did not see the detectives standing beside her walkway. “Hey there Field.” Lollipop called. The reporter did not even look at them. “Rude.” Pecan stated, as he reached out towards her. Lollipop put a hand on her partner’s shoulder. “Look at her face.” She said pointing. The hulking behemoth noticed that the reporter’s features were slack. “Hypnotism.” Pecan rumbled. Lollipop Jones was referring to the Fighting Sisters of the Closed Fist, an order of warrior nuns that had trained her. “Follow her?” Pecan offered. Lollipop nodded. As the reporter opened the driver’s side door of her car, the detectives climbed into the backseat. If she noticed, she didn’t give any indication.. Rachael N. Field cranked the car and started driving. “You are here at the sufferance of us all!” Dracula shouted, pointing at the Aztec Mummy. Crossing his arms, the Aztec Mummy sat down. “Is he pouting?” Dracula asked incredulously. Peter just shrugged. “Hrm, chge burrat.” Frankenstein’s creature said, his motor skills weren’t great yet, but he was learning speech: slowly but surely. The Aztec Mummy made a response, but its mask muffled the sound. “And take off that stupid mask or quit talking. It’s rude to mumble.” Dracula replied to the mumbled comeback. “How long?” Peter Stubbe asked. Henrietta Von Frankenstein checked her watch. “He should be here in about five minutes.” She replied. “Well, might as well get my game face on.” Peter Stubbe stated, as his nose began to elongate and black fur started to sprout from his pores. Rachael stopped her car in front of the old colonial home. Large trees obscured the front of the house, but the stairs were clear enough. Lights were shining inside the derelict structure. “Seems like a good monster hangout.” Pecan stated, stepping from the cramped car and stretching. With a light tap, Lollipop rendered the human thrall unconscious. Pecan caught her and set her back into her car. “Do you think we should knock?” Pecan asked, a feral grin on his face. The two detectives quickly devised a strategy. “Now why don’t you knock?” Lollipop Jones asked, as she vanished around the back of the house. Taking the front steps in two bounds, Pecan Sandie drew back and placed his gigantic fist directly in the center of the two entry doors. They rocketed off the hinges and flew into the foyer, sliding into the dining room. “Well someone’s being loud this evening.” Dracula stated. As the gathered monsters rushed from their seats towards Pecan Sandie, the massive man calmly plucked his flip out battle axe from his back. With a flick of his wrist, he extended the deadly weapon. As he started to laugh, a rumbling sound that echoed in the large old house, the monsters stopped, unsure of themselves. “Well?” Pecan Sandie challenged. Frankenstein’s patchwork man rushed forward, his mismatched fists raised above his head. Lowering his shoulder, Pecan slammed into the broad brute, bouncing him into the wall. The weight of the creature was too great and the wall collapsed, dropping the stitched together monster onto the weak floor boards. His attention turned towards the product of science, Peter Stubbe attached Pecan Sandie from behind. Spinning, the gargantuan detective caught the wolfman mid-leap and spun, releasing the furry fiend. As planned, the werewolf crashed into the Aztec Mummy, leaving both of them in a heap on the floor. “You tried to frame me? !” Pecan demanded. Looking at his downed companions, Dracula held his hands up innocently in front of him. “Okay, I can see why you might be upset, but this gathering is incredibly important for us. We couldn’t have you interrupting it.” Dracula explained. “Did you think that killing a museum guard and turning several others into vampires was not the best way to keep a low profile?” Pecan Sandie asked in his rumbling voice. “I know, the guard was just there and I had forgot to pack a snack for the trip. So I’m really sorry about that, but you know, accidents happen.” Dracula offered weakly. “You got this goon involved?” Henrietta Von Frankenstein asked from the dining room. As if on cue, Lollipop Jones rushed in from behind and planted the heel of her foot directly into the small of the noble nosferatu’s back. The well-dressed undead dropped with a groan. “I’m right here.” Lollipop stated. The wolfman, having untangled himself from the Aztec Mummy’s trappings, rushed towards the lithe female detective. With a quick turn, she planted her first in the fur covered abdomen of her attacker, delivering an Uber-Death Punch. The boneless werewolf collapsed in a puddle of fur. “Won’t keep him down.” Pecan stated. “I know.” Lollipop responded, as she turned her attentions back to Dracula. Two arms, both made from different pieces of men with scientifically enhanced strength, wrapped around Pecan’s chest, trapping his arms by his side. Struggling, the massive man mountain tried to break the hold of Frankenstein’s creature. Laughing, at least it sounded like laughing, but was muffled by its burial mask, the Aztec Mummy approached the struggling detective. A ceremonial bowl in one hand, with a raised obsidian dagger clutched in the other. Lollipop Jones saw her partner’s peril and turned to attend to it. Dracula grabbed her ponytail and hurled her away from Pecan. “Now you foolish wench! I have commanded nations and you think to defeat me.” He sneered, baring his fangs. As she bounced off the wall, the air was forced from her lungs, expelling her sucker across the room, where it shattered on the floor. Reaching up, Lollipop wiped a drop of blood from underneath her nose and saw her devastated sugary treat. “Now, I’m pissed.” She stated. Reaching inside her coat, she retrieved a pale yellow sucker that was almost translucent. “This one’s just for you.” She announced as she placed the confection in her mouth. Smiling, Pecan Sandie slammed his head straight back into the mad science project’s face. With a satisfying crunch, Pecan felt the vice like grip around him loosen. Straining, Pecan broke the bear hug and turned to face the monster. Dropping his axe to the floor, Pecan hoisted the behemoth off his feet and tossed him back into the dining room. “Heavy.” Pecan stated, stretching. “Why would you even have this?” Dracula questioned, as he finally wrenched the treat from his smoking forehead. With his bones half formed, the wolfman tried to pull himself over towards the crime fighters. Pecan grabbed the furry lump and tossed it into Dracula. “Are we good?” Pecan asked. Lollipop did a quick check around them. “Yup. Water’s on the left.” She answered. Frankenstein’s creature came rushing from the dining room. “I’m on it.” Lollipop stated. Pecan, trusting his partner, punched through the floor and came up with two different sets of pipes. One was PVC and the other was a rubber tubing. As the creature charged, Lollipop Jones stepped in front of the jigsaw juggernaut. Swatting at the diminutive detective, the monster gave Lollipop the chance she needed. Grasping the malformed arm, Lollipop pivoted and used the creature’s momentum against it. Sailing through the air, the hulking beast crashed down beside Dracula and the werewolf. Breaking the PVC pipe, Pecan began to spray the jumbled monsters with water. “Gato.” Pecan said. The luchador had the Aztec Mummy on his shoulders and was performing an airplane spin. “Gladly.” Azul Gato responded, tossing the bandaged bad guy among its soaking associates. “I plan on it.” Pecan said, cutting the rubber tubing with his battle axe. Sparks flew from the severed power line. The monster’s eyes grew wide as the massive detective dropped the line onto the wet floor. As the electricity coursed through the monsters, the most diabolical fiend entered the house: the creature from the law firm of Black, Lagoon, and Gillman. And not just a creature, but a partner nonetheless, Gillman himself was here to oversee the gathering. Its three piece suit was impeccable, with its green scaled head rising above a designer tie. “What’s the meaning of this?” The creature asked, staring at the scene before it. Its voice was watery and had a similar sound to a gurgle. Yeah, definitely an “innocent” looking gathering. “As I said, not all hope is lost. We can get something, but we have lost our chance to renew the contract under the old terms.” Gillman explained. She was ready to continue her fight. Behind her, Pecan Sandie stood with battle axe in hand, ready as well. Azul Gato leaned against the wall, his eyes watching the Aztec Mummy. “What’s the point?” Dracula lamented. Walking out into the night, the detectives watched as the Gillman got behind the wheel of a new luxury sedan and drove off. “Wonderful.” Dracula stated. A muffled laughter erupted from under the mask, the mummy said something and gestured to the other monsters present. “What’s he saying?” Lollipop asked. His laughter stopped as the mummy turned and watched as the other monsters headed for the door. Making a fist, Azul Gato cracked his knuckles. “Do you need any help?” Lollipop asked. “No. I will see you some other time amigos.” Azul Gato stated as he approached the bandaged fiend. 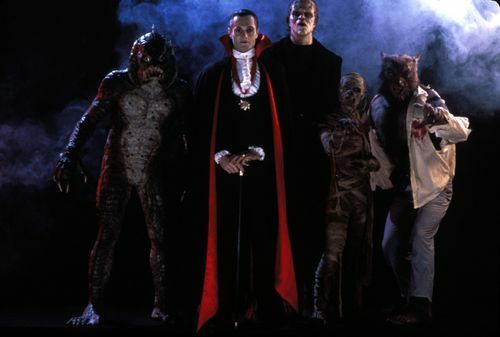 Stepping out onto the steps of the old house, the detectives saw a bat flitting away into the night, the wolfman disappeared into the woods, and Frankenstein and her creature were walking down the driveway. Rachael N. Field was waking up behind the wheel of her car. Shaking her head, the reporter cranked the car and drove off. “How did you know that would work?” Lollipop asked Pecan. “Don’t cross the streams, until you have to so you can save the day.” Pecan answered. 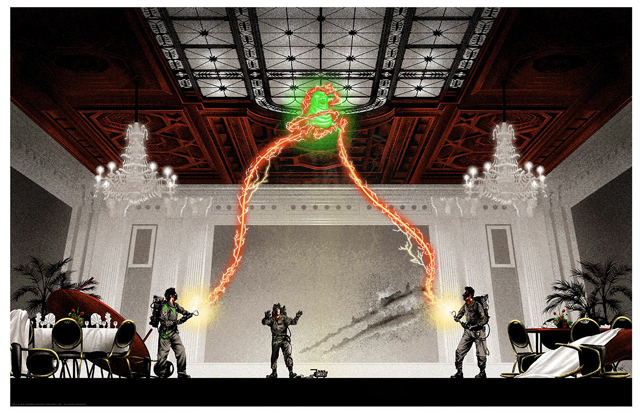 Right, never cross the streams. “Really, you’re going to end on a Ghostbusters’ quote?” Lollipop Jones asked. “Not you. I’m talking to you, Mr. Tucker.” Lollipop stated, shattering the fourth wall. “You’re going to end this five part story with a Ghostbusters’ quote?” She questioned. It’s the thirtieth anniversary, so yes Lollipop Jones, I am. 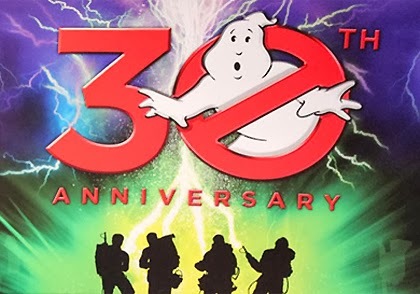 That’s right 30 years of mass hysteria.